Please check it out and to those of you who have already generously supported the project, THANK YOU!! 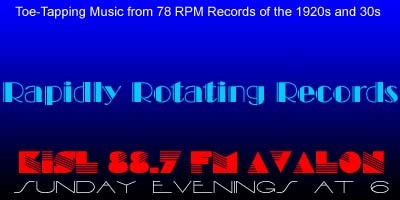 As for this week's Rapidly Rotating Records show, as always, just click on the link below to instantly listen streaming online and/or download the show. And your comments, topic suggestions and requests are always welcome. Enjoy! Kickin' A Hole In The Sky – The Tin Pan Paraders / Arthur Fields, v.
I Get A Kick Out Of You – The Dorsey Brothers Orchestra / Kay Weber, v.
Memphis Kick Up = Slim Lamar and His Southerners / Slim Lamar, v.
What A Man – Five Birmingham Babies / Arthur Fields, v.
Kiss Your Little Baby Good Night – Clyde Doerr AHO / Larry Murphy, v.
Give Me A Night In June – Clyde Doerr AHO / Scrappy Lambert, v.
Ain't Misbehavin' – Victor Orchestra Directed by Leonard Joy / Gene Austin, v.